I’m the manager of the SharePoint team for a large company, working to roll out Office 365 (SharePoint Online and OneDrive for Business) to our 40,000+ users. This is a project that was started a little over two years ago and we’re six months into the company wide roll out. A couple of weeks ago, our CIO challenged our IS department (800+ people) to adopt OneDrive as a replacement for their local home directory (network file share). There’s been two primary challenges raised by our users: How do I copy/upload lots of files/folders? 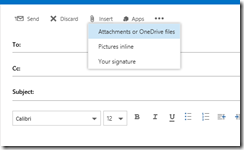 and how do I work with attachments in Outlook? How do I copy/upload lots of files and folders? The straight forward answer to this question is to simply copy your files/folders from your network file share to your local OneDrive folder, and let the OneDrive Sync Client do the work. Unfortunately, we had to disable file sync in our environment due to the lack of compliance controls (that’s changing, but we’re waiting to re-evaluate this until we see the new sync client due this fall. Check out this Microsoft Ignite session for more info). 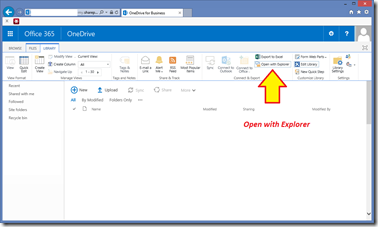 So, we turned to the new drag and drop functionality in SharePoint Online and OneDrive. One problem though: drag and drop uploading only uploads file(s) – it does not work with folders. Since these two options are off the table, that leaves us with one somewhat viable option: Explorer View. Explorer View can be accessed by going to the library tab for any document library and clicking the “Open with Explorer View”. 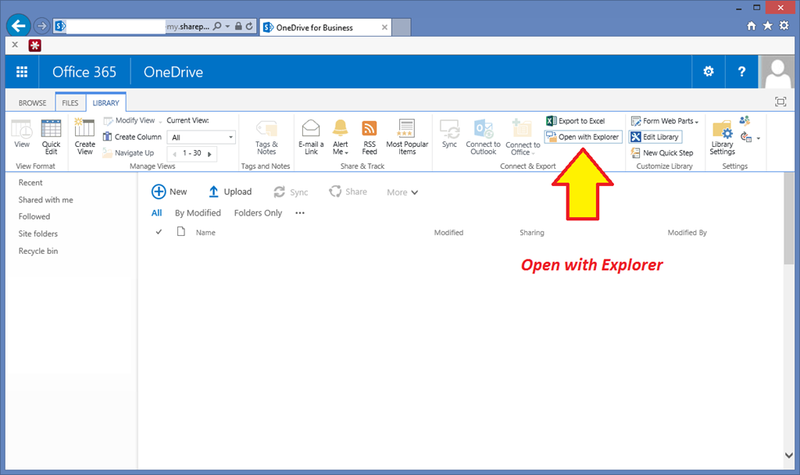 Microsoft put a minor hurdle in this path by hiding the ribbon by default in OneDrive, as they strive to simplify the OneDrive user experience. The bigger challenges with Explorer View are this: you must be logged into Office 365 (checking the box for remember me on the Realm Discovery page in ADFS environments), you must be using Internet Explorer, and you must be using a Windows PC. So why is IE a challenge? WELL, in our environment, IE8 is the standard due to some legacy applications that require it (IE11 compatibility modes do not work – nor do work arounds like Citrix, etc.). Given IE8 is not supported with Office 365 by Microsoft, we installed Chrome as a secondary browser on all desktops and have been telling our users to use Chrome with Office 365. This makes our guidance of using Explorer View and IE rather confusing for our users. 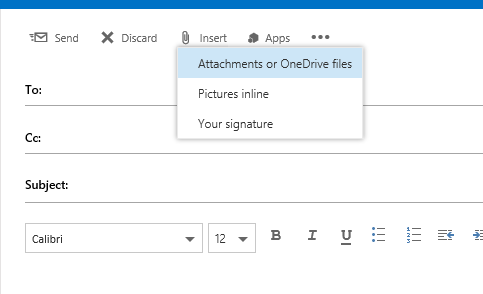 How do I save attachments to OneDrive and how do I attach files from OneDrive to an outbound email? This question comes up quite a lot and the answer requires a few steps. We have Outlook 2010/2013 deployed, so saving an attachment to OneDrive requires the user to save the file to a local folder (say, the desktop), and then they have to open the browser and upload it. Normally, a user would simply save the file to the local OneDrive folder, but we’ve disabled the sync client, so the file would never be uploaded. The reverse is also true. If someone wants to attach a file to an outbound email, they must first download the file to a local directory, and then attach it to the email. Another option available to our users is through Outlook Web Access (mail in the browser). If they use Mail, they can use the Insert menu in the email to attach a file, or better yet a link, to their document. This will avoid having to download the file and potentially losing track of which version of the document they are working on. As for receiving attachments, Microsoft has announced that this is coming to Outlook Web Access as well, which makes sense. Once that’s available, our users will be able to save to their OneDrive just as easily as sending from it. BUT, our users really prefer Outlook over Outlook Web Access, so what about Outlook? I don’t think Microsoft is going to add this capability to Outlook 2013, but it looks like they’ll solve this problem in Outlook 2016. In the screen shot on the left, you can see that an Outlook 2016 email window now has more options on the Insert menu. 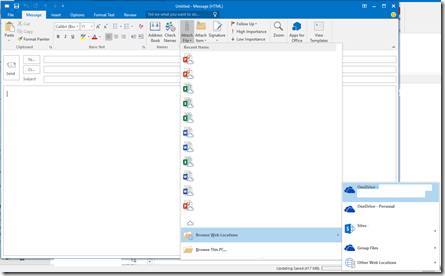 Those options list all of my recent files, as well as my cloud locations – OneDrive for Business, SharePoint Online sites, OneDrive Personal, etc. The Outlook 2016 preview doesn’t have a save to OneDrive option, at least that I could find, but I hope they do include one in the final release. Moving files to OneDrive isn’t just about storage costs savings for us, but also about changing work habits in order to really take advantage of Office 365. Teaching people how use Explorer View means they will continue to work with their files through the Explorer, much like we’ve done for decades. We also don’t want to teach people to send attachments, unless there is no other option for sharing files. 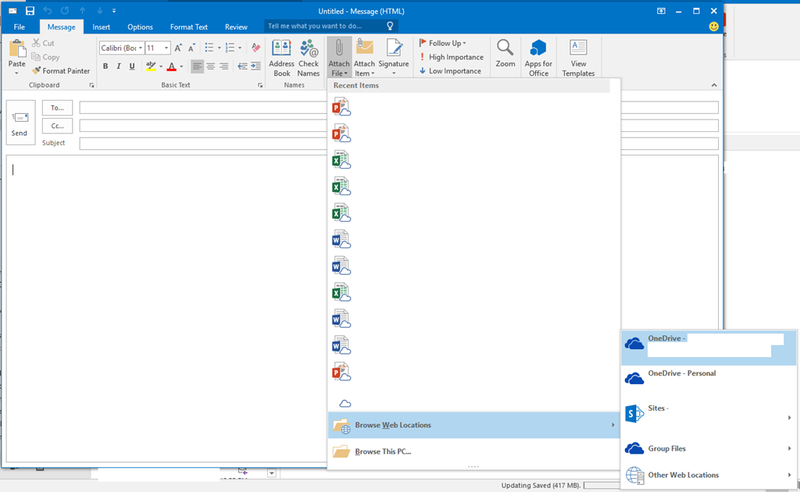 We point out how to share files from OneDrive, which allows co-authoring, version control, and much better management options for the document. This is where we’re going to gain efficiencies and really reduce costs. These questions/challenges are what people will ask when they are mapping their existing work patterns to new technology. It’s important that we do what we can to ease their transition, but we must be careful not to delay the real gains of Office 365.